Visitors to the rolling grasslands of Montana's Blackfeet Indian Reservation may wonder what animal is making a chirping sound. It sounds like a bird, but it's the mating call of the swift fox. The long-legged, long-eared and bushy-tailed animals were once common on the range, eating grasshoppers and Richardson's ground squirrels. Lewis and Clark first noticed the 4- to 6-pound foxes on the Rocky Mountain Front in 1805. 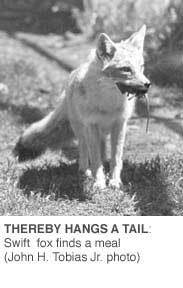 A century later, trappers captured 43 foxes east of Browning, Mont. But extensive trapping and declining prairie dog populations nearly wiped out the fox. Ranchers in Montana and North Dakota hadn't seen them in decades until 20 years ago, when Canadian biologists began a captive-breeding program. Some foxes made their way into the United States; then, last September, with $20,000 from the nonprofit Defenders of Wildlife, the tribe released 30 captive-bred Canadian foxes on the reservation. "It warms the heart to see them returned to their native homeland," says Ira Newbreast, director of the Tribal Fish and Game Department. Montana opposed the reintroduction at first, but officials eventually sent a letter of support to the tribe. "There was very little controversy within the tribe," Newbreast says. "The swift fox doesn't pose the many concerns that other animals, like the wolf or grizzly bear, do." Once a candidate for the endangered species list, the fox was dropped for consideration because it is still relatively common throughout southeast Wyoming, Colorado and Kansas. Some of the animals can also be found in New Mexico, Oklahoma and Texas.